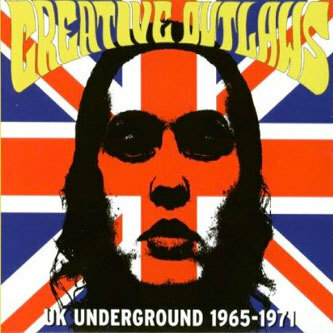 Dedicated to the memory of John Peel, this compilation from German label Trikont celebrates the more rebellious strains of British music through the mid-sixties to early-seventies, incorporating the first waves of psychedelic music and various other experimental tendencies inherent to British music during the period. The inclusion of big names like Nick Drake, Fairport Convention, The Small Faces and The Yardbirds might seem odd under that premise, but it's not entirely unreasonable to suppose that these artist's were operating at the creative fringes when they first emerged on the scene - certainly, Nick Drake only really found broad recognition after his untimely death. The most tangibly 'underground' music here though, comes from the likes of the Delia Derbyshire/Brian Hodgson project White Noise (whose always flabbergasting 'Love Without Sound' is included), John's Children, Ansley Dunbar's Retaliation, Lol Coxhill (covering I Am The Walrus'), Deviants, Liverpudlian beat poet Adrien Henri (whose ironic call for Batman to help out in the Vietnam war sort of anticipates Alan Moore's Watchmen) and prog-folkers Comus. Not everything here will be new to you, but this is a really great, thoughtfully put together compilation with an abundance of top class material. Highly recommended.